Since the establishment of Fo Yi Haemodialysis Society in year 1997, we have been receiving supports and donations from the various quarters of the society. We sincerely thank and appreciate these valuable and selfless contributions which propel us moving forward. To help the increasing number of kidney patients and realize the motto of Fo Yi, we set up a second unit of Haemodialysis Centre in Year 2007. At present, the number of kidney patients in these twi centres far exceeds 100. The monthly maintenance and clinical operating expenses are about RM 60,000.00 and these costs are huge enough to be borne. 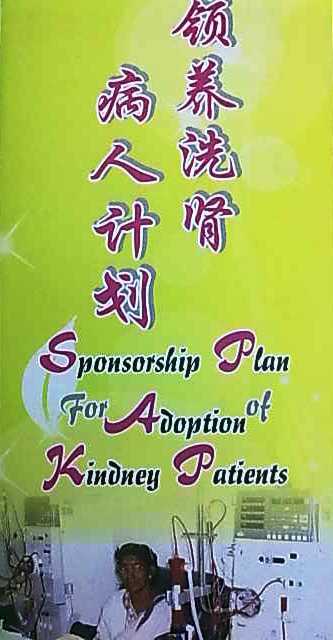 In view of this Fo yi would like to share these monthly expenses out with those willing and helpful by implementing sponsorship plan for adoption of kidney patients. Through this PLAN, everyone can contribute by adopting various schemes to lessen the financial burden of both Fo Yi and the kidney patients. 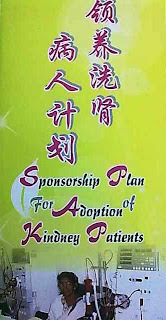 Fo Yi would like to invite you to become a sponsor by adopting any kidney patient in our centres and contributing monthly donations for his/ her clinical expenses. Your good deed and gesture will surely help lessening their financial burden and directly giving hope of life to them. With your kind support and contribution, life is full of love which everyone of us can cherish and interact for promoting a caring and empathic society.